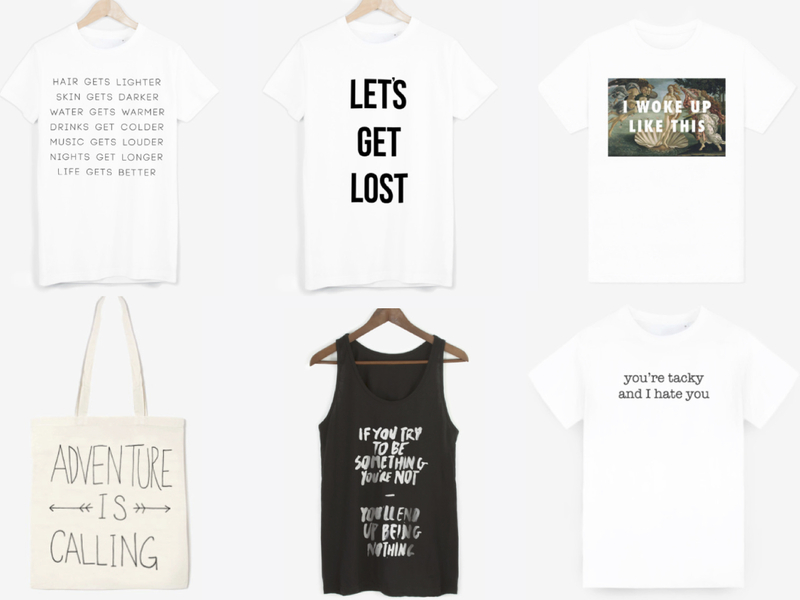 Who doesn't love a good slogan tee? I was sorting through my wardrobe and found lots and lots from my GK days and asked myself why I stopped wearing them. Slogan tees look super cute with shorts, skirts and jeans and here they are, sitting in my drawer, unworn for a good 2+ years. It does seem like everyone is raving about RAD right now and I dared to have a look at their website. Let's just say that I wish I hadn't because I now want more than 2 tees - that's just dangerous. I love a slogan tee in the summer so where better to start than The Summer Tee. It's simple but chic and so easy to wear. Following on from that is the Let's Get Lost tee because my love of travelling always peaks in the Summer. I would just love to get lost in a beautiful place when the sun is shining like it is right now. Does someone want to join me on a trip somewhere please? Of course, you need a bag when you're travelling and Adventure is certainly calling. I just love a tote bag me. I'm not too much of a fan of Beyonce but the whole 'I woke up like this' thing I find utterly hilarious. When I'm at uni I do literally wake up, run some dry shampoo through my hair and put on a bit of mascara. That's it. So, if I'm in the lab at 9am, I most certainly did wake up pretty much like that and it is so attractive (ha ha ha not). Who else loves the School of Rock? I found an article on Buzzfeed which I mentioned in an earlier post here and since then have rekindled my love for the film. It's hilarious and I wish I had been taught about rock music at a younger age. Maybe I'd be better at guitar now. Either way, you're tacky and I hate you is my favourite quote from the film by far. I'd be lying if I said I didn't say it on a weekly basis. Lastly, this tank top is true on so many levels. Sometimes you need a t-shirt that is far too deep for casual conversation and this one is it. If you try to be something you're not - you'll end up being nothing. I think we all need to remember this sometimes. It's really not worth being something your not. So that's it! Have you bought anything from RAD clothing before? Let me know! There is a 99% I just went onto their site and like you? Want more than two things on there. SO MUCH I WANT AND NEED IN MY LIFE. There's just so much! I couldn't deal. I want them all! I want them all :) I love these! There are so many nice tees - I can't deal! I used to be when I was younger and haven't for years. I'm so tempted now! I love all of these tees. They are great. The tote bag is awesome. The sweatshirt of the bag is new to the sale - I'm so tempted! I love School of Rock! That line alwaaaaays makes me laugh! Also love " You're gonna talk to me about style? You can't even dress yourself... look at that bow tie." I need to get me that t shirt! It has been on Film4 recently and I forgot how much I loved it. Such a classic film! I love slogan tees with attitude. Sassy is definitely the way to go! They really are. I love a funky slogan. P.S. I tagged you to do the love/hate challenge. I know right - thanks lovely! It's so funny! Such a classic film. I love that tote bag! It's so simple yet really cute. I want the "I woke up like this" one SOOO bad! I love all the art ones.